"Speed Is of the Essence"
Stuck in vehicle mode after a Renegade attack, Turbo is found and used as a race car by a pair of humans. On a solo mission to investigate reports of a new Renegade base, Turbo succeeds in locating the villains' new hideaway when he spots a broadcast array poking out of a butte. A jammer field prevents him from sending in his report, so he sets to dismantling the device, but he is detected by the Renegades and soon finds himself facing off against Crasher, Tank, and Screw Head. The evil trio lure him into triggering an explosive trap they have set up, and the blast hurls Turbo down the site of the butte. He survives, though badly wounded, and is pursued by the Renegades into the nearby town of Barstow, where he takes refuge in a junkyard. The Renegades search through the wrecks for him, but when a pair of a humans enter the junkyard, they elect to leave Turbo to succumb to his injuries and quietly withdraw rather than reveal their presence. The two boys—Don and Greg—stumble upon the unconscious Turbo, who has hidden himself inside a wrecked truck, and narrowly save him from an encounter with the junkard's car crusher when they decide to take him home and fix him up to use in the upcoming Barstow Grand Prix. 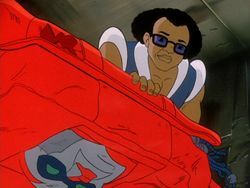 Once Turbo has been safely moved to Greg's garage, the boys puzzle over his alien engine and remove one of its circuit boards. 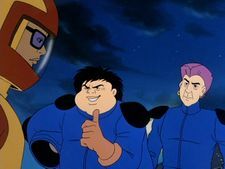 While they are out of the room, Turbo's self-repair systems kick in, healing his external wounds, but he is unable to speak or transform, and so must go with the flow when the boys take him out for a spin and show him off to local bullies Rick and Bill, against whom they will be competing in the race. Unable to contact Turbo, the concerned Guardians head for his last known location. They spot both the Renegades' array and Turbo's tyre tracks, so Van Guard goes to investigate the array while Scooter and Small Foot follow the trail into Barstow. 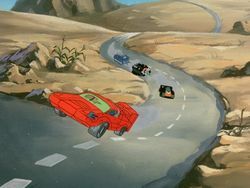 The tracks lead them to the town's speedway, where Greg and Don are driving Turbo in the Grand Prix. Unfortunately, the Guardians are not the only ones to recognize their comrade: Snoop, flying by overhead, identifies Turbo and informs Cy-Kill of his continued existence. Summoning Slicks and Spoiler via Astro-Beam, Cy-Kill sends them with Crasher to exterminate Turbo once and for all. The race track is already proving dangerous thanks Rick and Bill's cheating—tossing fireworks at Greg and Don, and shredding Turbo's tyres with a spiked ball bearing—but it's nothing compared to the destruction the three Renegades wreak when they smash their way onto the track and batter their way through the other competitors to get to Turbo. 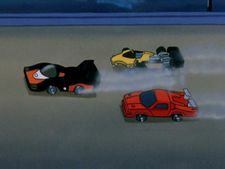 Turbo takes control of his body and manages to keep his confused "drivers" safe, dodging the Renegades' various attacks until the Astro-Beam wears off and Spoiler and Slicks disappear, leaving Crasher to go mano a mano with her Guardian rival. At the Renegades' butte, Cy-Kill and Cop-Tur prepare for a test-firing of the new superweapon they have been building in the secret base: an Electromagnetic Neutralizer, capable of blacking out all electronic systems so that Cy-Kill can hold whole cities to ransom. Alerted to the Renegades' activities in the area by Scooter, Leader-1 arrives to link up with Van Guard outside the butte, and together, the pair storm the Renegade base to stop the villains' plan. Cy-Kill sics Scales on the two Guardians, and although they are able to get around the beast by collapsing part of the ceiling on top of him, they are not fast enough to prevent the neutralizer from being fired. Back at the race, only Crasher, Greg and Don, and Rick and Billy remain in action. 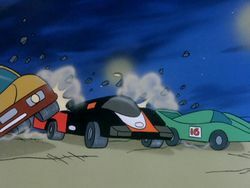 Determined to win, the bullies detonate a bomb they planted on Turbo before the race began, but the Guardian emerges from the blast totally unscathed, shocking the two cheaters so much that they swerve off the track and crash. Now it's down to Turbo and Crasher... and Crasher finds she's having so much fun racing that she's willing to wait until after she wins to finish off Turbo! Unfortunately for her, that's the moment the neutralizer beam hits the raceway, knocking out the spotlights. 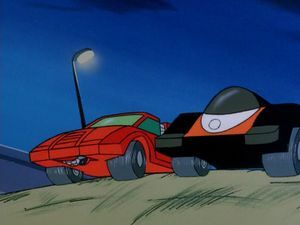 Turbo acts fast, firing up his headlights, but Crasher is too slow and doesn't see a sharp corner coming up in the dark. She goes flying off the track, while Greg, Don, and Turbo speed over the finish line—just as Leader-1 and Van Guard overpower Cy-Kill and destroy the neutralizer, lighting the speedway back up! 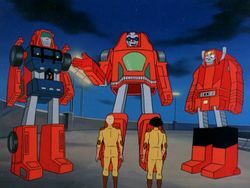 After receiving their trophy, Don and Greg watch as Scooter restores Turbo's damaged systems, allowing him to finally transform and thank the shocked boys for saving him. The Guardians bid their new human friends farewell and take off in pursuit of the Renegades, who have fled in Thruster. "One blast of the Electromagnetic Neutralizer and I can black out entire cities! No lights, no telephones, no communication whatsoever! Only I will have the power to restore electricity... and the bill will be huge!" "Fancy running into you, Turbo!" "When the lights go out at the speedway, there'll be uncontrollable panic. Crasher will be thrilled!" After losing the race, Rick and Bill moved to Angel Grove to start a new life. "Speed Is of the Essence" features the broadcast debuts of Van Guard, Slicks, and Spoiler, but all three will go on to feature in the "GoBotron Saga" mini-series, the events of which take place prior to this episode. Slicks and Spoiler will be teamed up as a twosome for a second time in "Whiz Kid." 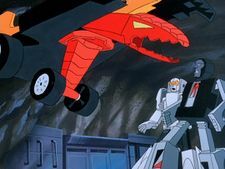 Also making his broadcast debut this episode is the animalistic Renegade Scales, perhaps a deliberate inclusion to be in-keeping with the "race car" theme of the episode, even though he's not part of the Grand Prix. However, the later episode "Invasion from the 21st Level, Part I" features a scene clearly written to serve as the dramatic introduction of Scales to the audience, so chronologically, "Speed Is of the Essence" ought to be placed after that two-parter. This episode includes the first use in the series proper of the idea established in the pilot mini-series that the Astro-Beam is temporary, and that those transported by it will be slingshotted back to their departure point after a certain amount of time passes. Exactly how long that amount of time is always seems wholly dependent on the needs of the plot, but later episodes will claim it is 48 hours, which obviously isn't how long it takes in this story. Crasher at least has the decency to preserve some semblance of future continuity by noting that the beam is unexpectedly "reversing ahead of schedule" for some reason. Cy-Kill laments that his "beautiful weapon is ruined!"... but all Leader-1 did was turn it off. He did zap it first, but nothing happened, and it continued to function until he pulled the switch to deactivate it. The Guardians don't actually destroy the Neutralizer until the Renegades have already retreated. Speaking of their retreat... was Thruster just sitting out in the open, standing on its end, all that time? Why did nobody see that? It could have been hidden via stealth device, but Van Guard is only heard observing that the ship has disappeared, not that it has appeared out of nowhere. When Cy-Kill whips the tarp off the Electromagnetic Neutralizer, and again when he sics Scales on the Guardians, his normally-black "cheekbones" are the same grey as his "stubble." It's not clear where the cloud of dust/smoke that blinds Turbo as he tries to get away from the Renegades comes from; it might be kicked up by blasts from Crasher that overshoot Turbo, but Crasher later makes a remark that Turbo "choked on his own exhaust." While Turbo is being blinded by the aforementioned cloud, the background painting of the road isn't moving, making it look like he's wiggling on the spot instead of swerving back and forth. 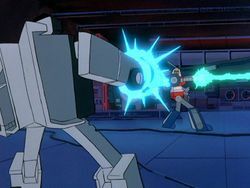 In the following shot, as Crasher and Screw Head drive toward the "camera," the luminous effect is missing from Crasher's headlight-blaster beams, exposing the empty black area of the cel beneath. Then, the footage abruptly loops, but this time, the effect is present. See the comparison image at right. As Bill moves away from Rick to place the bomb on Turbo, the cuff of Rick's brown glove blinks blue. When Crasher ploughs through the other racer, a layering error causes a small green car that's supposed to be in the background appear on top of another vehicle. Slicks apologizes to Crasher as he and Spoiler Astro-Beam out early, but his voice is only heard (saying "Sorry, Crasher!") several seconds after they have fully disappeared. While he watches Scales attack the Guardians, Cy-Kill's nose is grey. 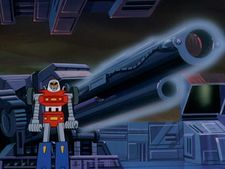 The angle is supposed to change when Cy-Kill returns fire on Leader-1, but the same background painting is used, just moved further over to the right, so it's like everything in the shot just suddenly jumps to the left. Small Foot's eyes are missing from her visor as she and the other Guardians say goodbye to Don and Greg. Cy-Kill is missing his "stubble" in the first shot of the final scene aboard Thruster. This page was last edited on 29 April 2017, at 15:50.